This article is about the Nintendo 64 title. For the series as a whole, see Mario Tennis (series). For the Virtual Boy title, see Mario's Tennis. Mario Tennis[a] is a sports video game developed by Camelot Software Planning and published by Nintendo for the Nintendo 64 video game console. The game was released in North America and Japan in the summer of 2000, and released in Europe later in November. 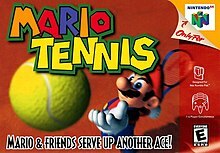 It is the first tennis-based game starring Mario since Mario's Tennis, and the second game developed by Camelot on a Nintendo system. The game is known for being the introduction of Luigi's evil doppleganger, Waluigi, and the re-introduction of Princess Daisy and Birdo. A Game Boy Color version, also developed by Camelot and Nintendo, was published under the same title in Western regions and as Mario Tennis GB in Japan. Mario Tennis was re-released on the Wii Virtual Console in 2010 and on the Wii U Virtual Console in 2015. The game's success led to four sequels: Mario Power Tennis released for the GameCube in 2004, Mario Tennis Open released for the Nintendo 3DS in 2012, Mario Tennis: Ultra Smash released for the Wii U in 2015 and Mario Tennis Aces which was released for the Nintendo Switch in 2018. Marking the sixth Mario game for the Nintendo 64, Mario Tennis brings eleven new characters to the Mario Tennis franchise, including Waluigi (who made his first appearance in the Mario series overall in this game), Princess Daisy, Wario, Shy Guy, Donkey Kong and Birdo. Through the use of a Nintendo 64 Transfer Pak, players are able to import their characters from the Game Boy Color (GBC) version of Mario Tennis to the N64 game, as well as the characters' stats. After connecting Mario Tennis for GBC with Mario Tennis for the Nintendo 64, various options become available; Yoshi, Wario, Waluigi and Bowser can be sent to the GBC version, and the GBC version characters Alex, Harry, Nina and Kate can be transferred to the Nintendo 64 version. Using the latter four characters, experience points may be earned to transfer back to the GBC version. As the characters go up in levels, one may send his or her improved characters to the N64 version to level up again. The game uses a control system that differs from most other video tennis games on the market. Shots are performed by pressing one, or both, of the two main buttons (A or B), which make the ball spin in different ways. Pressing a button twice strikes the tennis shot with more power and spin. Additionally, pressing the two buttons in a different order can result in a different type of shot altogether, such as a lob or drop shot. Both buttons can be pressed at the same time to hit a very powerful smash shot. The longer a button is pressed before contact is made with the ball, the stronger the shot will be. The control system allows players of all levels to become familiar with the mechanics of the game within a very short time, whilst also encouraging advanced players to take advantage of the variety of shots on offer to come up with different strategies for winning points. A total of seven types of shot are possible using only the two main buttons of the controller. These gameplay mechanics were later brought to the newer games of the Mario Tennis series. Mario Tennis received critical acclaim, with critics citing the accessibility and depth of the controls as being very impressive. The game physics and amount of content have also been praised. The Nintendo 64 version received "universal acclaim" according to the review aggregation website Metacritic. Dutch magazine Power Unlimited gave the N64 version a score of 9.1 out of 10, calling it very addictive, especially with four players. Mario Tennis sold over 200,000 copies within two weeks of its release. It became the eighth best selling Game Boy Color game in Japan, with 357,987 copies sold. A Game Boy Color version was released on November 1, 2000 in Japan; January 16, 2001 in North America; and February 2, 2001 in Europe. It features a wide variety of human and Mario characters for the player to use. The game also features mini-games such as a tennis version of a shooting gallery where, as Donkey Kong, the player must hit the banana targets on the wall to earn points in a set amount of time. A role-playing game mode appears on the Game Boy Color version, which is not in the Nintendo 64 version. In this mode, players begin as a rookie tennis player at the Royal Tennis Academy, who must build up their skill by leveling-up through training and practice matches before entering various tournaments. The aim of this mode is to be crowned champion at the academy, although the second part of the game involves the player competing in a tournament to ultimately face Mario, the best tennis player. The role-playing is playable in singles and doubles (separately), effectively doubling the game's longevity. There are training facilities that can help the player progress. ^ Frankle, Gavin. "Mario Tennis (GBC) – Review". AllGame. Archived from the original on November 14, 2014. Retrieved January 19, 2015. ^ Melville, Bryan. "Mario Tennis (N64) – Review". AllGame. Archived from the original on November 14, 2014. Retrieved January 19, 2015. ^ Edge staff (October 2000). "Mario Tennis (N64)". Edge (89). ^ EGM staff (March 2001). "Mario Tennis (GBC)". Electronic Gaming Monthly. Archived from the original on March 9, 2001. Retrieved January 19, 2015. ^ "Mario Tennis". Electronic Gaming Monthly. 2000. ^ "ゲームボーイ – マリオテニスGB". Famitsu. 915: 111. June 30, 2006. ^ "ニンテンドウ64 – マリオテニス64". Famitsu. 915: 30. June 30, 2006. ^ "REVIEW for Mario Tennis (N64)". GameFan. 2000. ^ Brogger, Kristian (February 2001). "Mario Tennis (GBC)". Game Informer (94). Archived from the original on December 30, 2002. Retrieved January 19, 2015. ^ McNamara, Andy; Helgeson, Matt; Reiner, Andrew (October 2000). "Mario Tennis – Nintendo 64". Game Informer (90). Archived from the original on December 10, 2000. Retrieved January 19, 2015. ^ Jake The Snake (January 5, 2001). "Mario Tennis Review for Game Boy Color on GamePro.com". GamePro. Archived from the original on March 19, 2005. Retrieved January 20, 2015. ^ Davis, Ryan (January 26, 2001). "Mario Tennis Review (GBC)". GameSpot. Retrieved January 19, 2015. ^ a b Provo, Frank (August 30, 2000). "Mario Tennis Review (N64)". GameSpot. Retrieved January 19, 2015. ^ Quigley, Shawn (February 7, 2001). "Mario Tennis (GBC)". SportPlanet. Archived from the original on February 23, 2001. Retrieved March 20, 2017. ^ Ballerine, Bill (September 12, 2000). "Mario Tennis (N64)". SportPlanet. Archived from the original on December 27, 2004. Retrieved April 28, 2016. ^ Harris, Craig (January 24, 2001). "Mario Tennis GBC". IGN. Retrieved January 19, 2015. ^ a b Casamassina, Matt (August 18, 2000). "Mario Tennis 64 [sic] (N64)". IGN. Retrieved January 19, 2015. ^ Thomas, Lucas M. (June 30, 2010). "Mario Tennis Review (Wii)". IGN. Retrieved January 19, 2015. ^ Latshaw, Tim (January 2, 2014). "Mario Tennis (3DS eShop / Game Boy Color) Review". NintendoLife. Retrieved January 20, 2015. ^ van Duyn, Marcel (June 22, 2010). "Mario Tennis (Wii Virtual Console / Nintendo 64) Review". NintendoLife. Retrieved January 20, 2015. ^ "Mario Tennis (GBC)". Nintendo Power. 141: 124. February 2001. ^ "Mario Tennis (N64)". Nintendo Power. 135: 116. August 2000. ^ Boyce, Ryan (August 28, 2000). "Mario Tennis (N64)". Maxim. Archived from the original on August 10, 2001. Retrieved January 19, 2015. ^ "Mario Tennis for Game Boy Color". GameRankings. CBS Interactive. Retrieved October 29, 2018. ^ "Mario Tennis for Nintendo 64". GameRankings. CBS Interactive. Retrieved January 19, 2015. ^ a b "Mario Tennis for Nintendo 64 Reviews". Metacritic. CBS Interactive. Retrieved January 19, 2015. ^ "The Academy of Interactive Arts & Sciences:: Awards". Interactive Achievement Awards. Archived from the original on October 6, 2008. Retrieved March 31, 2008. ^ van de Ven, Boris (November 2000). "Mario Tennis". Power Unlimited. 8 (11): 68–69. ^ IGN staff (August 3, 2000). "Mario Tennis Takes Japan". IGN. Retrieved January 19, 2015.